With Isla's birthday party coming up this weekend and her actually birthday on Monday (yep, I'm in the corner crying), I thought this would be the perfect time to share the ultimate first birthday gift guide! Here are ten items that my little ladies STILL play with to this day! 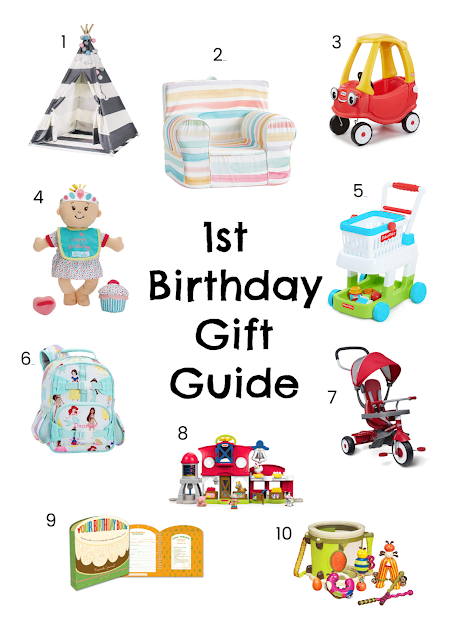 Take a peek at my top ten favorite picks and be sure to tell me if you have a go-to gift for when you attend a first birthday party. 1: Kid's Play Tent or Teepee- My girls LOVE to use their imagination and use our play tent as their house, ice cream shop, hotel, dr. office, you name it, this is a favorite at our house and really encourages imaginative play! 2: Pottery Barn Kids Anywhere Chair- Not only does this chair make for a super cute photo-op, but my little ladies love to lounge on these chairs with a big basket of books and we like to set up a pretend movie theater with their chairs during our family movie nights. 3: Fisher Price Cozy Coupe- This one is such a "milestone" toy for my little ladies, we got our cozy coupe when Avery was right around 18 months and at this point this car has quite a few miles on it! We love to draw sidewalk chalk towns with roads and my little ladies have so much fun pretending they are running errands. Bonus, these coupes come with a board you set inside, allowing you to push your little one around until they are old enough to drive with their feet! 4: Wee Baby Stella Baby Doll and Birthday set- We are big fans of baby Stella around here, she is the cutest, softest little doll and both of my older girls still play with theirs! I think this would be the cutest gift to give to any little one, especially with the birthday set, I know my girls would have so much fun setting up a pretend birthday party for their baby Stella. 5: Fisher Price Shopping Cart- We LOVE to play grocery store, book store, Target and Costco (not sure where they got that idea, ha) and this little shopping cart makes our pretend play even more fun. I also love that if you don't have a large space for toys or toy storage, you can throw your play food in the cart, fun to play with AND provides some great storage! 6: Pottery Barn Kids Mini Backpack- I have gifted these mini backpacks to quite a few little ones, including my girls and my three nephews. We love to pack these bags up with lots of snacks, stickers, notebooks, crayons, etc. and take them along on road trips and to Sunday mass. It's another great gift that the kiddos can grow in to a bit. 7: Radio Flyer 4-in-1 Trike- This is what we got Emerson for her first birthday and she still uses it two years later! I LOVE any toy that grows with your kiddo, we pushed Emmy to the park on this little trike MANY times and I'm sure this Spring she will now be able to pedal it all by herself! 8: Little People Farm- Ok, maybe I included this because it's one of Mommy's favorite toys to play with. But, we LOVE all the Little People houses, cars, people and accessories, we have the farm, princess castle, school bus, plane and a ton of princesses and play with it all the time. I love a toy that my 5, 3 and 1 year old can all enjoy together! 9: Birthday Book- One of my friends gifted this to Avery and it is my go-to birthday gift! There is a single page to fill-out each year, along with a pocket to collect some memories from each age, it's SO easy and manageable and will serve as the sweetest keepsake as the girls grow-up. 10: B Toys Parum Pum Pum- This was another gift that Avery got for her first birthday and we still play with ALL the time! The Snyder Sister band should really hit the road with their singing and dancing show, at this point we also own the B. Toys doggie guitar and cat piano, the little ladies should think about staring in their own library sing-a-long tour! Bonus: Some of our very favorite gifts don't include any "things" at all! We are so thankful when the Grandparents treat to a fun class, like swim lessons or a family pass to the zoo or children's museum. If you live in the Chicago land area, we have a Brookfield Zoo pass and a membership to the Kohl's Children museum that we use all the time! I hope you added a few new ideas to your list of gift ideas, it can be so hard to buy for little ones and my biggest piece of advice is gift them something they can grow into and grow up with! These ten toys have survived the test of time, as you noticed many of them were gifts that Avery got when she was one and she is now FIVE. If you follow us on Instagram (@snyderfamilyco) you will also see us playing with every single one of these toys, we own them all! I loved sharing this gift guide with you and hope you'll give me some of your favorite gift recommendations! Adorable ideas! Have a wonderful weekend Brittany! Thanks Holly, we had so much fun celebrating our birthday girl!